Everyone dreams of bringing their four-legged family member on all of their trips with them, right? This dream isn’t always pawsible for jet-setting pawrents, but for humans with small pups, flying can be a reality. If you’re lucky enough to travel with your pooch, there are a few things you should keep in mind for your dog’s safety and well-being. 1. Make sure your dog is the right size to fit under the seat comfortably. Unfortunately, the size of your dog is important when deciding if you can bring him in-cabin with you. Airlines have strict regulations when it comes to the size of pet carriers. They must be able to fit underneath the seat in front of you (therapy or service dogs are an exception). Typically dogs around 15 pounds or less can fit comfortably in the mandated size of the airline-approved pet carrier. 2. Make sure that your dog has the right temperament to fly. While I’d love to say that any dog can travel easily, it’s just not the case. High-stress dogs or dogs with high anxiety levels might not be the right choice to take with you on a plane. The reason for this? It’s simply not worth the stress for your poor pup. Not to mention, some airlines require your pup to be well-trained, or quiet to fly. Vocal dogs might not be the best choice for a small aircraft. If you think your dog would be particularly scarred by taking flight, do him a favor and keep all four paws on the ground. There are wonderful doggy resorts or dogsitters available to take great care of your pup while you hit the beach. 3. Find a pet carrier that your dog is comfortable in. Make sure to look up your airline’s requirements in terms of the size and type of carrier that you are allowed to bring your pet in. While each airline varies slightly, most require the carrier to be between 16 and 19 inches long or less, and about 10 inches tall. Don’t try to make your pup fit in a carrier that is too small for him, it could stress him out even more. Also, an important thing to note is that your dog’s carrier will now become your carry-on. That means that you are only allowed to bring one other personal item in the cabin. You will have to stow the other carry on to keep your dog by your feet, try to choose a carrier with extra pockets on the side for your book, magazines, etc. that you might want to keep handy. 4. Pack all your dog’s necessities. While baggage often gets lost in translation, it’s important to make sure you have enough food, toys and treats to get your pup through a few days when you land. Make sure to bring a non-spill water carrier, and maybe a bone to keep your furry friend occupied during the long flight. Don’t be alarmed if your pup doesn’t touch his favorite rawhide that he usually devours. This could just be due to travel anxiety. Similar to when humans get butterflies when they lift off! 5. Call ahead to reserve a space for your dog. 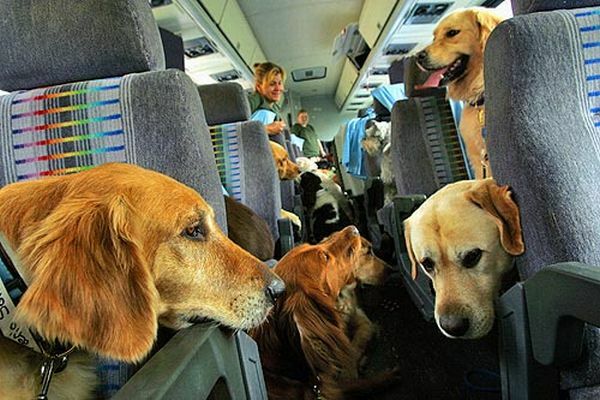 Most airlines only allot a certain amount of dogs to fly in-cabin, so make sure to call way ahead of time to book your pup’s spot and make sure there is room for him. Sometimes when flying with your pup you are allowed to board first – yes, dogs are V.I.P. – and you are usually given the middle seat, as there is more room. 6. Be prepared to pay extra fees. Bringing your best furrrend on your trip is definitely not cheap. Depending on the airline, flying just one way with your dog can cost over $100. Budget your trip and see if there is room to bring your pup on board with you, or if he should stay back for a special week with Grandma and Grandpa. 7. Make sure that you have a health certificate for your dog from the vet. Even if your airline doesn’t specifically call for one, go ahead and get a health certificate from your vet just in case. It doesn’t cost too much, and it’s always better to be safe then sorry. This certificate will show that your pup has had all his shots and vaccinations, and is perfectly A-OK to travel in-cabin with you and the rest of the passengers. 8. Line your pup’s carrier with DryFur pad. No matter how potty-trained your pup is, accidents happen, especially in high-stress environments. Line your dog’s carrier with DryFur which wicks away moisture to keep your pup comfortable. If you think he needs to pee, carry him into the restroom with you with a wee wee pad and see if he can go there. 9. On the day of the trip, take your dog for a long walk before leaving. Ideally, this will leave your pup tired enough to take an in-flight nap! A tired dog is typically less antsy, and it will help to get some of his energy out before he is cooped up in his carrier for the duration of the day or night of traveling. 10. Don’t feed your dog that morning and take away water bowl two hours before departure. This may seem harsh or cruel, but dogs really are fine without water for a few hours. This will help avoid accidents on the flight, and will keep your dog comfortable. His nerves might upset his stomach anyway. Some humans like to avoid heavy meals the morning of flying, dogs are just the same. 11. During the flight gauge the water you give your dog. Make sure to ride the fine line between avoiding dehydration and giving your pup so much to drink that he is crossing all four of his legs. Some pet owners like to offer their dog an ice cube to play with during the flight. This helps to hydrate them and keep them occupied for a few minutes. Simply ask your flight attendant for some extra ice cubes in a cup when they walk by with the beverage service. 12. Be prepared to not allow your dog out in the airport, except when going through security. Most airports do not allow dogs at all, unless they are in their pet carrier. However, things are different when you go through security. Your dog will go through security with you and his carrier will go through the conveyor belt. Some owners who have flown with their pups haven’t had a problem with letting their friend stretch his legs in the gate, but be pupared to be reprimanded by airport authority if it’s not allowed. 13. Be prepared for the plane’s environmental conditions. Some planes have floor air conditioners, in which case your pup might get cold. Pack extra blankets to keep him warm and comfortable during the flight. Another great idea is to line his carrier with one of your t-shirts. The familiar smell will keep your pup at ease while he can’t jump up into your lap. 15. Only use sedatives as a last resort. Sedatives should only be used for a nervous dog under the direction of a veterinarian. However, they aren’t always a great idea. Sedatives and medication can have negative affects, like unsteadiness and breathing problems. These can make your dog more uncomfortable than he was before the pills. Again, know your pup and be honest with yourself. If you think the experience will be too traumatizing for him. If you think it will, then find a responsible doggy nanny to give him his own four-legged vacation. 16. Enjoy exploring new territory with your furry friend. When all is said and done, traveling with your pup can be totally worth it! Not only will you have your whole family with you on vacation, but dogs are excellent companions for exploring new places. Travel somewhere new and let your pooch be the Lewis to your Clark.